Summary: A little girl addresses water as she experiences it in many different forms: “Hey, water, I know you! You’re all around. You spray up. And down,” she says, as the illustrations show a faucet, sprinkler, and shower. Each page has a single word on it, as well as the picture and line(s) of text. Although the text is spare, the book explores different states of matter, bodies of water like lakes and rivers, properties of water, and its importance in our everyday lives. 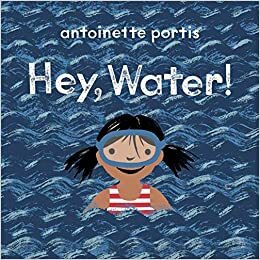 “Hey, water, thank you!” the narrator concludes; the pages following that have information on water forms, the water cycle, and conserving water, as well as additional resources. 48 pages; ages 4-8. Pros: For such a short and entertaining read, this book packs a pretty good educational punch, providing an excellent and engaging introduction to many aspects of water. Cons: While the section on conserving water emphasizes the importance of doing so, it doesn’t give any practical tips.